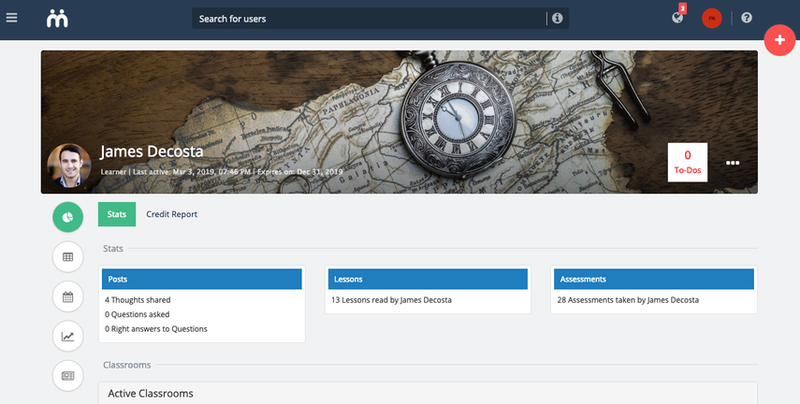 The Parent module allows a parent to view their children activities (such as last access report, grades & scores, upcoming events & deadlines, events that have passed, and recent submission made by the child for assessments) without being enrolled in their classrooms or having access to restricted information. Note: For the parent module to work, parents and their children profiles should exist on Teamie. 1. Click Sliding menu at the top-left. 2. 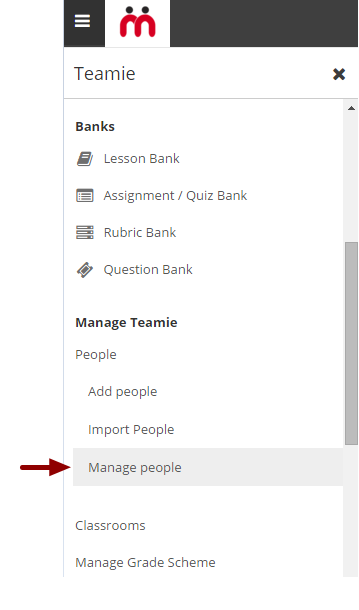 Under Manage Teamie section, click People and then choose Manage People. 3. 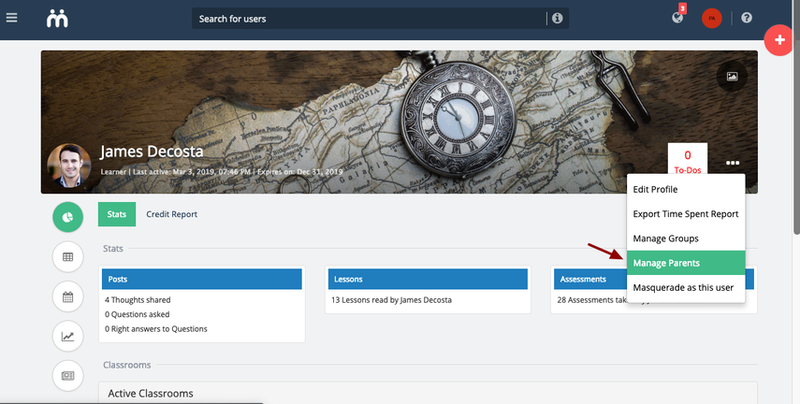 On the people listing page, search a child (a learner is referred to as a child) to which you wish to assign a parent. 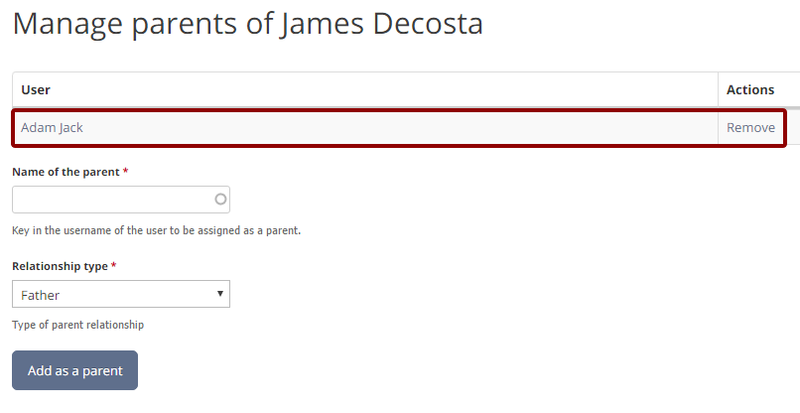 In this scenario, we are assigning a parent to a child named James Decosta. To search for a specific child, you can enter your child's email and click Apply as shown in the below screenshot. 4. Access the Child's profile page by clicking on his/her name. 5. Click the ellipsis (...) and select Manage parents from the resulting drop-down. 6. Type the parent name in the given text box and then choose the parent from the auto suggestion list. 7. Select the Relation type from the drop-down menu. By default, the relationship is set to Father. 8. 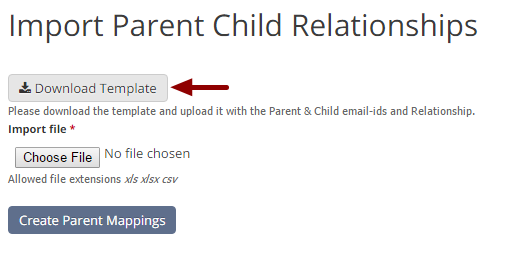 Click Add as parent to assign the selected parent to the child. 9. A message appears to confirm that parent was added successfully. 1. Access the child's profile page by clicking on his/her name. 2. Click the ellipsis (...) and select Manage parents from the resulting drop-down. 3. Click Remove next to the parent's user name to remove the assigned parent from the child. The manual process of assigning parents to their children one at a time can prove to be quite cumbersome if the parent list is long. 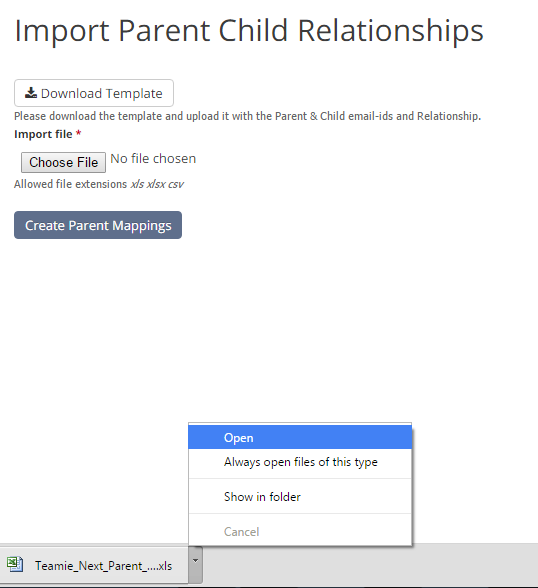 To avoid the manual process, you can use the Parent-Child relationship template to enter the parents and their children data just once and then initiate the bulk import process. This way you can assign all the parents to their children at once and save your precious time. 1. 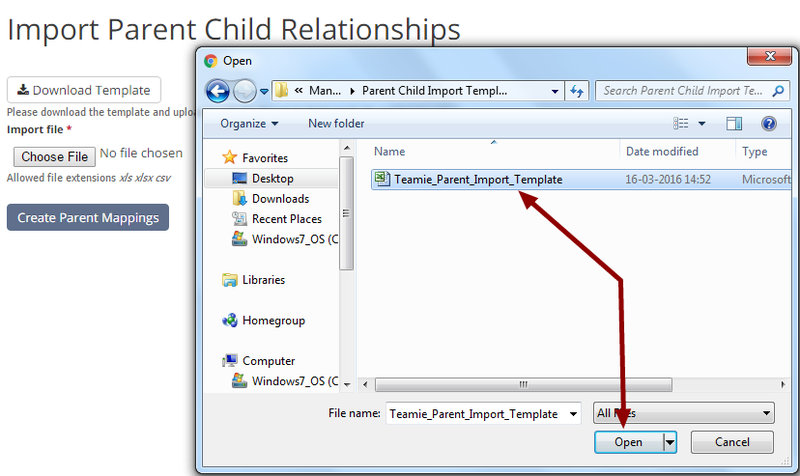 Under Manage Teamie section, click Parent and then choose Import Parent Relationship. 3. Open the Template to fill in the required data. 4. Enter the parent's email in Parent Email column. 5. Enter the child's email in Child Email column. 6. Select the Relationship type of the parent with this child from the Relationship drop-down. 7. 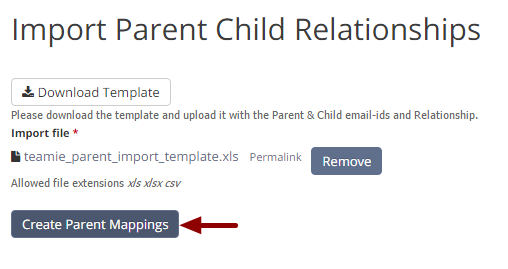 Repeat step 4,5 and 6 to add more parent child relationship data in the template. 8. Once you have entered the required information in the respective columns, the excel sheet is ready to be imported into Teamie. Click Choose File to select the template. 9. Select the Template and click Open to upload the template. 10. Selected template will be uploaded shortly. Click Remove to remove the template in case you need to make some changes and upload later. 11. Click Create Parent Mappings. 12. You will see the progress of parent child relationship process on your screen. 13. 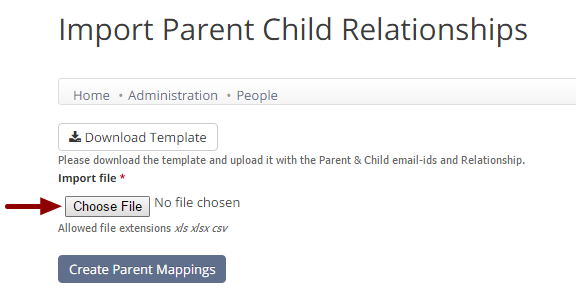 Once the import process is successfully completed, you will be redirected to the Manage People page, where you will see a confirmation message that the selected number of Parent-Child mapping is successfully created. 14. Access the Child's profile to see the parent assigned to him/her.